Like many school SLPs I went back to work today after a long lovely 2 week vacation! Hope your first day back was splendid. I spent mine assessing students to get ahead and changing my schedule around a bit. I will be back to my regular speech and language therapy groups tomorrow. I wanted to share something with all of you (instead of favorite apps, a girl can change her mind can't she?) that I find helpful in my speech room. I had students constantly asking "What are we doing today? When is it sticker time? When do I come to speech? or What day is it?" I went to an Autism training called SCERTs Model-it's a model of assessment and intervention for students with Autism that specifically focuses on Social Communication, Emotional Regulation and Transactional Support. If you have not attended this training I highly suggest you do! Emily Rubin, MS, CCC-SLP is an amazing speaker and this training changed my approach to students with Autism and opened my eyes to some new research. The one thing not so Autism related that I gathered from this training was the use of a "Help Box". Yesterday, Today and Tomorrow dates-sometimes I pair this with a calendar so students can understand the concept of time and when they come to speech etc. 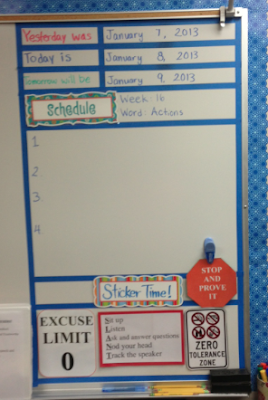 The word of the week given to use by the district-but I might change this to include vocabulary words. A big open box for schedule of speech lesson-this changes depending on groups and sometimes I just alter a few words. Last is always Sticker Time! 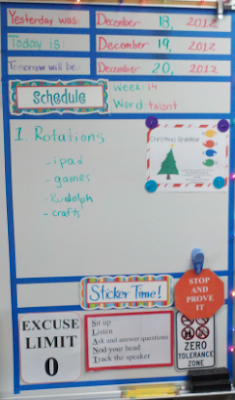 Having a schedule to refer to helps me because I have a written lesson plan on the board to record in my plan book. It also helps me because all I have to do it point to it when the student asks a repetitive question and teaches them where to look for resources. I find that my students with and without Autism like having a schedule! They have one in class, so why not in speech? Both my SAI and I have one to keep things in our special education room similar. Do you have a Help Box in your speech room? What does it look like? How well does it work for you? I would love to hear comments or questions!